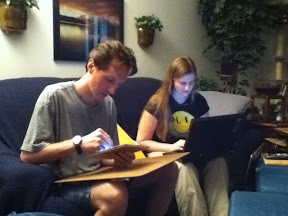 Adam and Comfort are in town this weekend for JAFAX, which is a local Anime convention at GVSU in Allendale. First up, Chris showed them some awesome apps on the iPad. In the above photo Adam is trying out one of the apps (procreate) to color one of their sketches. 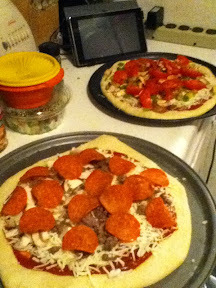 Next, we enjoyed some tasty home made pizza. You cant really tell in the photo, but their vegetarian pizza was all kinds of tasty-colorful! I wish I liked peppers. They certainly brought a liveliness to an otherwise typically-red (for us) pizza. 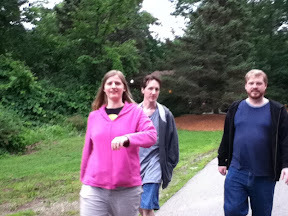 After such filling pizza we took a nice stroll down Kent Trails. We ran into a couple of deer who were just grazing along the side of the path. One thing I do enjoy is having the trail so nearby. It's easy to hop on and hop off. We finished out the evening the new Green Lantern animated movie, Emerald Knights. All in all, it was a fantastic Friday. 813/365 - Light, Camera, Flash! 805/365 - Portable Arcade Machine!